PHARMACEUTICALS AND HEALTHCARE: Seize the opportunity! Sales is vanity, profit is sanity and cash is reality!! The pharma industry is always on a roll in India! Check the growth of pharma industry in India as depicted in the bar graph below: We observe that the Indian retail pharma industry has grown from Rs. 25307 crores (June 2006 MAT) to Rs. 36527 crores MAT June 2009. This has happened in 3 years - if we extrapolate this growth it is not an exaggeration to expect the pharma industry to become a Rs. 50000 crores (retail pharma formulation sales only) industry by say MAT Dec 2012. Around Rs. 13000 crores to Rs. 15000 crores of extra retail pharma business will take place (over and above Rs. 36527 crores) by MAT Dec 2012, as per my hunch. So the moot point is who will take this business? Definitely there will be some smart pharma companies who will be a part of this growth when the Indian retail pharma formulations market may reach size of Rs. 50000 crores (ie., by MAT Dec 2012)! While it is vital to understand that the 4 Ps (Product, Price, Promotion and Placement) will be critical to grow in the Indian pharma market - the PRODUCT itself will play a key role. a) THE CORE PRODUCT: The generic is the core product. For eg., when a patient is prescribed Calpol tablets, the doctor may be prescribing it for the generic it contains ie., PARACETAMOL 500 mg. However, Calpol or any other brand is much more than the core product. The brand is not merely the generic. b) THE ACTUAL PRODUCT: This part of the product is built around the core product. For eg., assume some hypothetical features of a brand of a paracetamol suspension. This product contains paracetamol 120 mg per 5 ml. The doctor may be prescribing it for this generic. However, the suspension is much more than the generic offered by it. and the polymer PET bottle that makes the product attractive, safe, unbreakable and patient friendly. These are the aspects of ACTUAL PRODUCT FEATURES that enhance marketability and acceptability of the product. Similarly, pharma marketers enhance actual product features by incorporating innovations such as Alu-Alu pack, calendar pack for oral contraceptive tablets, informative and educative patient information leaflets, very attractive packaging ... so on. Such innovations in the actual product help in product differentiation, brand recall, brand loyalty and finally marketability. c) THE AUGMENTED PRODUCT: refers to the additional services and benefits that are offered with the core and actual product. The augmented product features are most important in pharma marketing. Doctors are not prescribing merely for the core product features or actual product features. This is the major difference between consumer goods and pharma goods. Doctors are prescribing for the additional services and benefits associated with that of a pharma brand. Pharma marketers build in augmented features in the product through their MRs. The field personnel offer clinical reports, share clinical experiences, offer gifts, sponsorships, samples, freebies, and other packages as part of the augmented product that helps raise prescriptions and sales. Today, the augmented product is under threat due to strict guidelines of Medical Council of India (MCI). This has been widely reported in the media. For eg., Chronicle Pharmabiz, dated, 11.2.2010 on page no. 28 states that MCI warns doctors of cancellation of registration for accepting freebies from companies. Now to what extent this will work in India is a million dollar question! In all probabilities this will not work much because freebies are a major part of the relationship between pharma marketers and doctors. Without it pharma marketing is a limp force!! In any case, what this development indicates is that pharma marketers should reduce focus on the freebies associated with augmented pharma product. It means that in India, pharma marketers should take up to more of CME (continuing medical education) based marketing. Since, doctors cannot be sponsored air tickets and stay facilities (as per MCI guidelines), pharma marketers should see to conducting virtual CME programs, video conferencing based CMEs and and offer more print and electronic inputs (like CDs etc) on technical issues, communicate through internet, sms etc. Furthermore, pharma marketers will obviously start focusing on services and offers to chemists/pharmacists. The augmentation of the product towards the chemist retailers will only increase because come what may, for a pharma marketer sales should happen! Pharma marketers will also work on actual product and core product features to overcome any obstacles in offering augmented product features to doctors who create demand for healthcare products through their prescriptions. So pharma marketers may start using active ingredients that have more crystalline purity or laevo chirals to create more talking points on their products. However, products like ELECTROLYTE ENERGY DRINKS (manufactured with Tetra Pak aseptic technology) for management of dehydration and debility will see increased consumption because they score very high on ACTUAL PRODUCT FEATURES. Thus, we are at a very interesting phase of pharma marketing in India. On one hand there is abundant potential. The Indian retail pharma formulations market is poised for higher growth and say by Dec 2012 or Jan 2013 it may reach Rs. 50000 crores. So another Rs. 13000 crores to Rs. 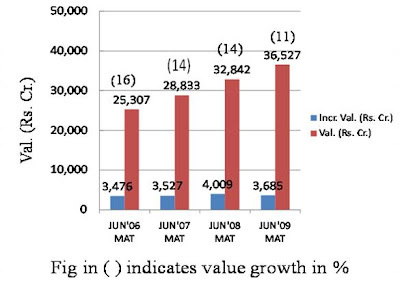 15000 crores will be added to the figure of MAT June 2009 figure of Rs. 36527 crores. However, there are obstacles, MCI has come out with strict guidelines that affect pharma marketing. If doctors do not take freebies (ie., augmented pharma product features are curbed), then obviously doctors will not have great pleasure or incentive to increase consumption through more prescriptions. So pharma marketers have to find a way out - particularly the big national companies. It will not be a surprise to observe that small PCD, regional and subregional companies will continue to offer freebies in their areas of operation. Their activities will go unnoticed at the national level. These companies are too local to attract attention, so regional and subregional companies will probably grow very aggressively in the next three years, when the Indian retail pharma market will reach the magic figure of Rs. 50000 crores. Nevertheless, pharma and healthcare marketers who have better core product or actual product features for their product portfolio (such as electrolyte energy drink in aseptic technology category) will fare better. We are seeing the Indian Retail Pharma Formulations Market in yet another interesting crossroad type situation in its journey to the magic figure of Rs. 50000 crores! So let us see what interesting pictures unfold!! Thanks for reading this blogpost, please scroll down and do read all other blogposts. Kindly recommend this blog to your acquaintances. This is an extremely brilliant, insightful and relevant article. The Pharma market in Nigeria is developing really fast too, I see this as a prediction of where we are going and the insights here are really helpful to stay ahead of the pack! Absolutely brilliant! Thank you! Thanks for your encouraging comments. Please continue to read my blog! !